Curracag – the Outer Hebrides Natural History Society – held their first indoor meeting of 2019 in the Dark Island Hotel on 8 January. The speaker was John Love who has been a member since the Society’s inception. Based in South Uist, John was formerly an Area Officer for Uist, Barra and St Kilda with Scottish Natural Heritage, also a former Chairman of Curracag and, for several past issues, editor of their journal Hebridean Naturalist. Appropriately his talk was about Highland Naturalists, tending to focus on the Hebrides with a selection of home-grown individuals and a few other notable characters. After the ’45, travel through the Highlands and Islands became easier and even the elderly Dr Samuel Johnson was able to journey extensively in 1772. An eminent naturalist of the 19th century was William MacGillivray. Born in Aberdeen but raised in Northton, Harris, MacGillivray later walked all the way to attend university semesters in Aberdeen. He claimed ‘the solitude of nature was my school’ and how he had ‘reaped most advantage from solitary travelling.’ He even walked all the way to London to visit its Natural History Museum and went on to become a museum curator himself first in Edinburgh then assuming the Chair of Natural History back in Aberdeen. MacGillivray wrote many scholarly books and was well known for leading his students ‘to take to the fields and the woods, the mountains and shores, there to examine for themselves the rich profusion of nature.’ Indeed, it was said, he frequently walked ‘the most active of them into a state of limp helplessness’. John Love himself gained his degree in natural history at Aberdeen where he first encountered the name and exploits of William MacGillivray. William was also an accomplished artist and many of his fine bird paintings are now in the Natural History Museum. Our speaker went on to highlight other distinguished naturalists who shared a profound interest in the Highlands such as JA Harvie-Brown, Seton Gordon, Robert Atkinson, Frank Fraser Darling and J Morton Boyd – all greatly influencing him as a youngster. On joining the Inverness Bird Club in 1959, he was to meet Seton Gordon himself, Morton Boyd – who would later become his boss in NCC/SNH, George Waterston and Lea MacNally – all eagle enthusiasts. George was then Scottish Director of the RSPB who inspired John to volunteer at the Loch Garten Osprey hide in the summers of 1963/64. Lea MacNally was a stalker/naturalist in Fort Augustus who went on to take some wonderful photos and write several books about Highland wildlife. From his schooldays John was mentored by two birdwatchers in particular. Dr Maeve Rusk was an ophthalmic surgeon at Raigmore Hospital who held regular clinics in the Hebrides. She was president of the local Bird Club, took John on her monthly duck counts and taught him how to mist-net and ring birds. The Club secretary was Inverness Police Inspector James MacGeoch, a keen photographer and island enthusiast. At the time MacGeoch was Honorary Warden for North Rona and Sulaisgeir National Nature Reserve and had recorded on film the famous Gannet or Guga hunt by the men of Ness. Sadly Jimmy died soon after retiring from the police but Maeve died in 2011 aged 93. Recently, with the MacGeoch family and his friend Dr Finlay Macleod from Ness in Lewis, John was able to see MacGeoch’s classic photographs of the guga hunt published by Acair. North Rona was to feature prominently in John’s island experiences, ringing Leach’s Petrels, one of which was retrapped there no less than 30 years later. 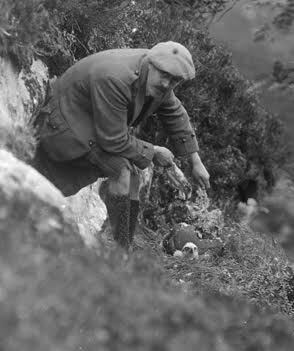 From his time in Rum John became good friends with Dr John Lorne Campbell, the eminent Gaelic scholar and folklorist from Argyll; it is less well known that he was a passionate lepidopterist and planted many trees to create wildlife habitat on the Isle of Canna which he bought in 1938. In 1975 John became involved in the White-tailed Sea Eagle Reintroduction Project on the Isle of Rum – championed by Morton Boyd, encouraged by Roy Dennis and George Waterston, and assisted throughout by a host of others. Shetlander Bobby Tulloch typically provided John with a couple of amusing anecdotes in his talk. As did Professor George Dunnet from Caithness who, as lecturer at Aberdeen University, initiated a long-term study of fulmars in Orkney. 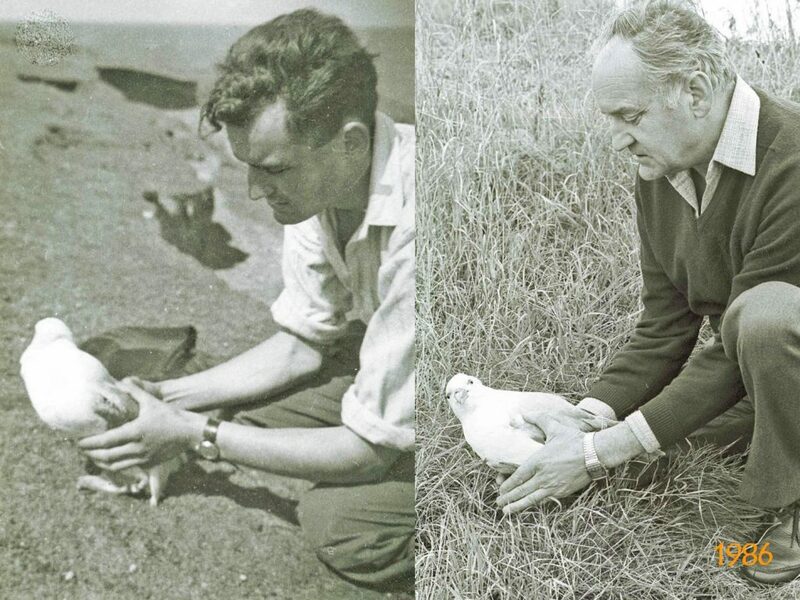 John showed a photo of George handling the first fulmar he ringed there in 1951 and then another taken in 1986 as he held the very same bird – it looked exactly the same but George had not weathered quite so well! John could not end his talk without mentioning Murdo MacRury from South Uist who became the first Nature Conservancy warden at Loch Druidibeg. Also two redoubtable naturalists (and columnists in the local Press), Peter and Andrew Currie. There are many others of course it was clear at the end of the evening that not only have the Highlands, and the Hebrides in particular, attracted many fine naturalists over the centuries but they have also generated many of their own. John just felt fortunate to have encountered a few of them in his own lifetime. 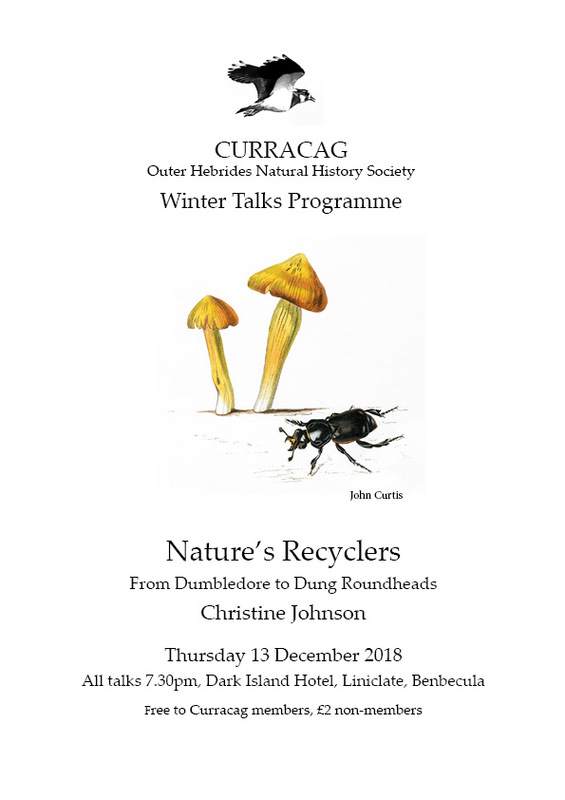 Christine Johnson gave a talk for Curracag on 13th December 2018 in the Dark Island hotel; it was organised by Martyn Jamieson. Christine started with a diagram to show the importance of ‘Nature’s Recyclers’; in both terrestrial and marine environments there is a huge range of plants, from tiny plankton to huge, old trees. These take in from their surroundings water, air and various minerals, and through the power of sunlight digest them and form further plant material. Over time ephemeral parts of plants and eventually the whole plant will die, if it hasn’t been eaten: various animals from tiny larvae to elephants, consume different types of or parts of plants; then, in due course some of these ‘Primary Consumers’ are themselves eaten by carnivores – the ‘Secondary Consumers’, and they in their turn may be eaten by other carnivores: the ‘Tertiary Consumers’. All these life forms consuming inevitably produce waste, and indeed in time die themselves, leading to masses of dead plant material, dung, droppings, faeces, and carcasses. Where does it all go? Why are we not wading through a morass of waste products? – which, in a temperate woodland would amount to 5 tonnes of plant and animal material per hectare. Although this is waste to the producers, it contains useful elements which can support a huge range of organisms: up to a thousand species per square metre, e.g. bacteria, fungi, and small invertebrates such as nematodes and larger worms, springtails and woodlice. Christine then concentrated on the fungi, explaining that the part we see above ground is the fruiting body – which may drop spores [the ‘toadstool’ type], or catapult them over a distance [like puffballs]. The part in the growing medium – underground or embedded in leaf litter or wood – is a network of very thin tubes [hyphae] which collect and digest the material for growth; this network can extend over huge distances, in Siberia, for instance, over hundreds of square miles. Only fungi can digest cellulose. There are very small ones which grow on leaves and conifer needles; once they have started the process of breaking down leaf litter other large types move in, and may appear to be growing from the soil rather than reduced plant material. Fruiting bodies on the edges of some of these networks produce ‘fairy rings’. Some fungi grow on dead wood, the hyphae extending into the wood and softening it; when timber falls, other fungi may move in. Some opportunistic fungi will grow on processed timber such as pallets and chipboard. Not all fungi are processing dead material; some cause problems in live plants, such as root rot in conifers; the oyster mushroom grows on standing trees and derives its nutrition from trapping and digesting nematodes. While animal scavengers generally deal with the soft parts of other animals, fungi will grow on hard remains such as hair, feathers and bones, eventually digesting them. Dung consists of partly digested plant material, mainly cellulose, and there are fungi that grow on dung and break it down. As these deposits are often scattered, to ensure that some spores may reach a hospitable site, they are scattered over the grazing area and ingested by the animals, then emerge already within a good growing medium. In the UK alone, there are about 400 species of fungi living on dung. Christine’s talk was well illustrated with pictures of some of the amazing range of fungi, from large and robust ones to tiny delicate ones, some of them microscopic. It was a fascinating introduction to a small number of an extraordinary range of species and their very important function in the environment. 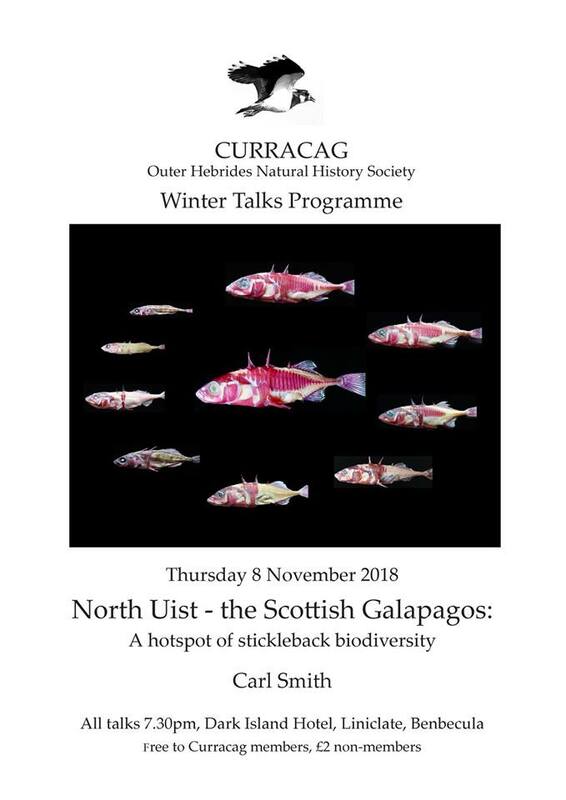 On Thursday 8th Novemeber 2018 a small group assembled in the Dark Island Hotel to hear Carl Smith speaking on ‘North Uist – the Scottish Galapagos: a hotspot of stickleback biodiversity’, a talk organised by Martyn Jamieson for Curracag, but open to anyone interested. Those of us with any familiarity with North Uist are well aware of the numerous lochs scattered across the island in the range of local habitats: moorland and peat bog, machair and the blacklands, and the lagoons in which the salinity can vary from almost marine to practically freshwater, depending on rainfall, tides and spray. Few of us will have realised that these support an extraordinary range of forms of the three-spined stickleback – and that the Queen Charlotte Islands off the west coast of Canada are the only other area in the world known to have a similar diversity of sticklebacks, though there is no suggestion that there is any connection between the two populations – they have developed their differences independently. Carl Smith, a reader at the University of St Andrews, has been studying sticklebacks for twenty–five years, including ten years in North Uist. Our sticklebacks will have arrived in the islands only after the last glaciation which covered the islands so 15,000 years ago or less. 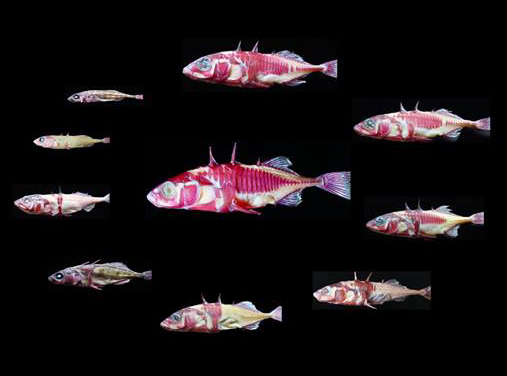 Probably marine sticklebacks were stranded in freshwater systems or entered them as sea levels changed after the glaciers melted. Marine three-spined sticklebacks are nearly 3” [7cm] long, have three spines on their backs, bony plates on the sides of the body and fins in the pelvic area with spines that can be locked in place, so small but well protected. In the lochs of North Uist the same fish takes various forms, from something very close to a marine type to a much smaller creature about half the size of the marine form, with no spines, no bony plates and no pelvic fins or spines. There are intermediate forms with varying sizes of spines, areas of plates and pelvic fins or not. One gene controls the differences in the plate formation. The semi-saline lochs have fish close to the marine type; the machair loch fish range between those with medium protection and those with little, and the peatland lochs contain a range of fish with some plates to those that are completely defenceless and small. Low levels of calcium in these lochs may partially explain the lack of bony features, though other kinds of fish manage to extract enough calcium from their environment to grow normally. Trout, together with birds and eels, are great predators of three-spined sticklebacks; trying to assess predator levels in lochs led to Carl Smith and his teams fishing a range of lochs with special flies made to look like three-spined sticklebacks, and the conclusion that predator numbers did not explain the presence of small defenceless fish. At present he is working on another explanation as to why there should be so many different forms of these fish. How does North Uist compare with the Galapagos? One species of finch arrived there about 5 million years ago and over time their descendants have adapted to the different habitats and food sources on the islands in the archipelago, and developed into different forms now recognised as fourteen distinct species. It looks as though the North Uist sticklebacks might be undergoing the same process, but much more rapidly. Whether the tiny defenceless form found in some lochs can really be regarded as the same species as the stoutly armour-plated and spined fish in the sea and lagoons is debateable – but there are all the forms in between. Dr Smith kindly answered numerous questions and there was some interesting discussion following his fascinating talk. One point of some concern is that other researchers are interested in the North Uist sticklebacks and specimens are in demand. The numbers of the different types in the different lochs are unknown, so whether they might be endangered by over collecting is also unknown. In some lochs there may also be a detrimental effect from, for instance, run-off from application of agricultural fertilisers on the adjacent ground or close to feeder streams, or the presence of fish farms with associated nutrients and build up of fish faeces. So far the lochs of Benbecula and South Uist seem not to have attracted the same attention; perhaps they also support a diversity of three-spined sticklebacks. Dr Smith has contributed a paper to the latest volume of the ‘Hebridean Naturalist’, available through the Curracag website, so anyone seeking an authoritative account should look there! Without the decay of animal and plant matter and the recycling of nutrients, life would grind to a halt. Fungi, together with bacteria and some invertebrates, are the main agents in the process of decomposition, and the participation of fungi in this process is probably their most important role. This talk will illustrate the great diversity of fungi and some of the invertebrates which are nature’s recyclers. The AGM will be an opportunity for members (new and old) to learn about the plans for the future and participate in the discussion. An agenda for the AGM will be available shortly and will be shared here. Please come along and help us make the islands natural history thrive. New and old members are equally welcome to come along and renew their membership on the evening. A reminder that the second of our winter talks is just one week away. 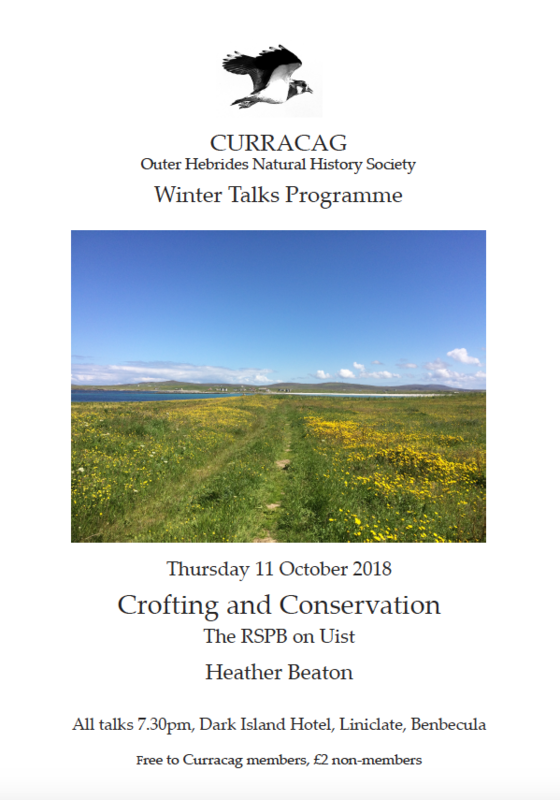 Just a reminder that the first of the Curracag winter talks is just a week away. Wednesday 11 July at 7 pm. Heather Angel is a highly versatile British award-winning wildlife photographer whose images have a strong artistic appeal as well as scientific authenticity. 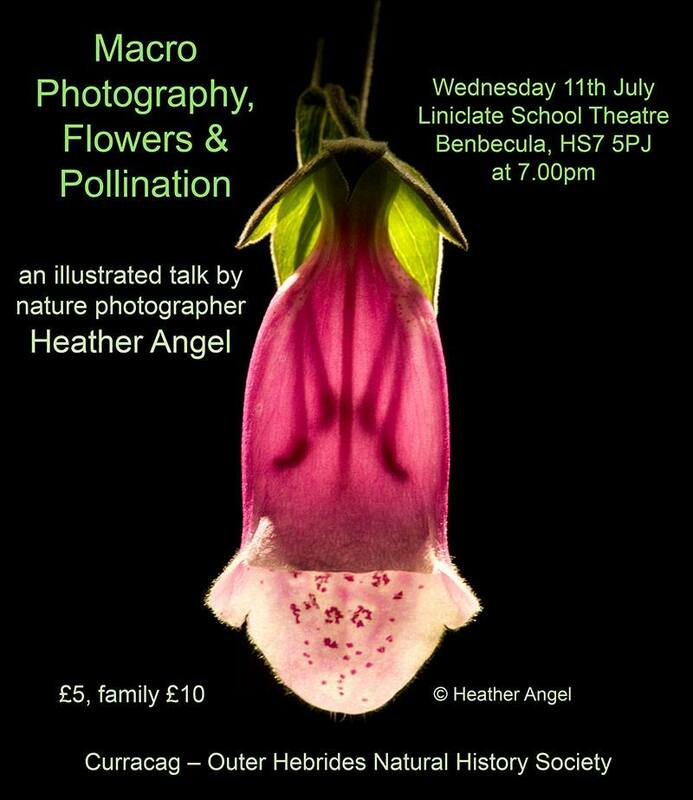 For more than three decades, Heather has been at the forefront of nature photography in Britain and her work has been recognised by many awards in Britain and overseas.